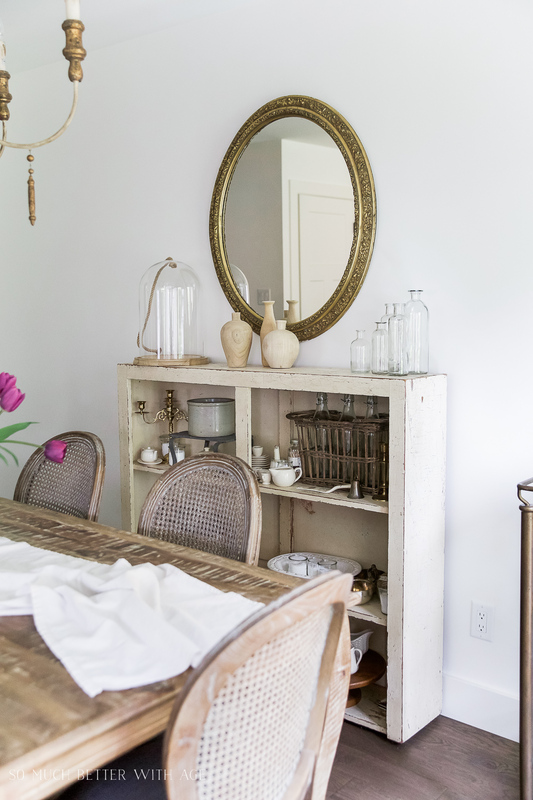 Have a look at my before and after French vintage dining room makeover. Because the main floor of this house is quite long and narrow and small on space, I didn’t need a living room and a family room so I got rid of the family altogether, expanded the kitchen and made the previous family room into the dining room. 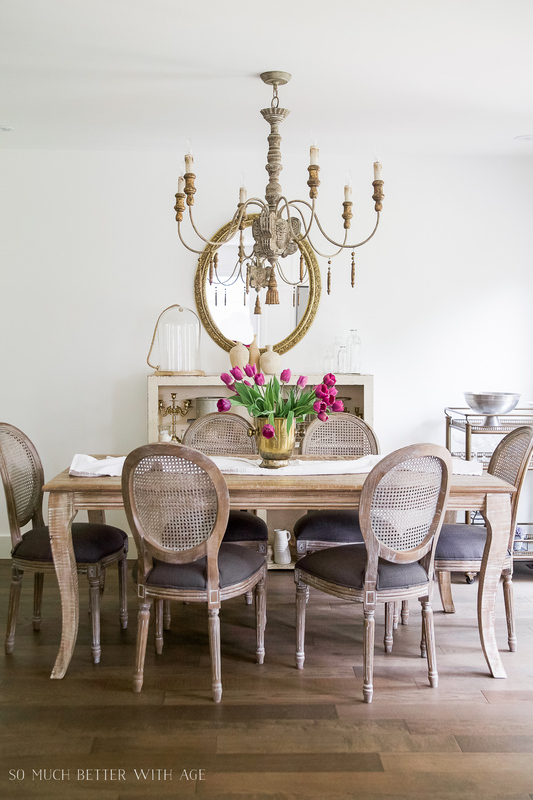 For us to make the room work as a dining room with my French Vintage flair, the fireplace had to be removed. 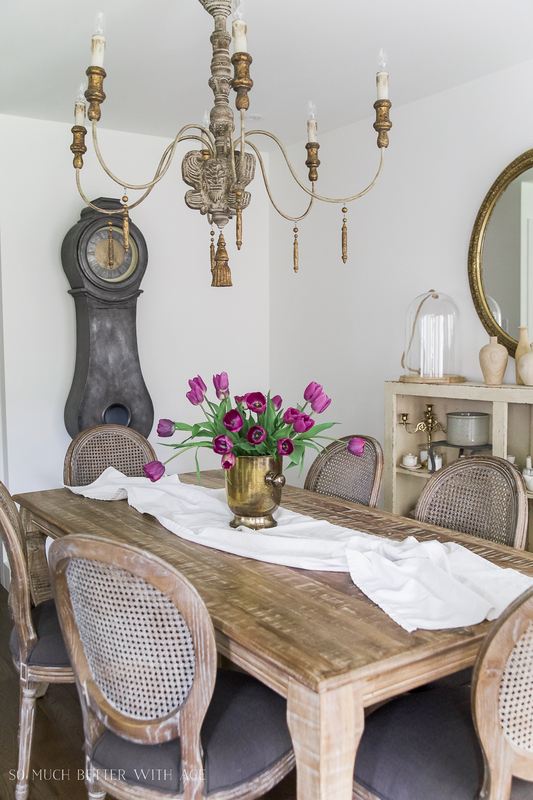 My French Vintage dining room that was once a family room. 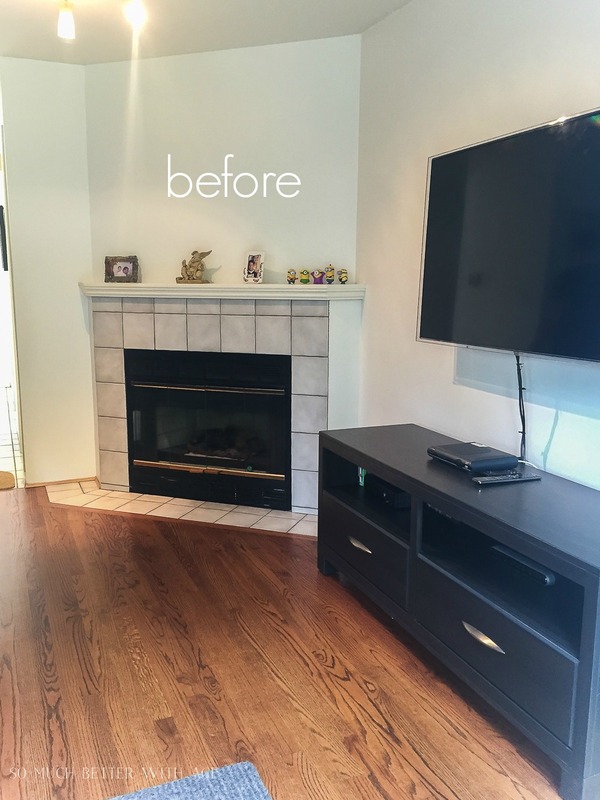 By removing the corner fireplace, it allowed more room for a dining table and it opened up the whole space. This room connects the kitchen to the hallway, a door to the basement and to the back deck. It seemed odd to me that there was a TV on one wall with a couch on the other wall and the middle of the room was a busy traffic zone. Here is the door to the basement and to the right of it is the hallway to the powder room, mudroom and foyer. This wall was so small it just fit a love seat. 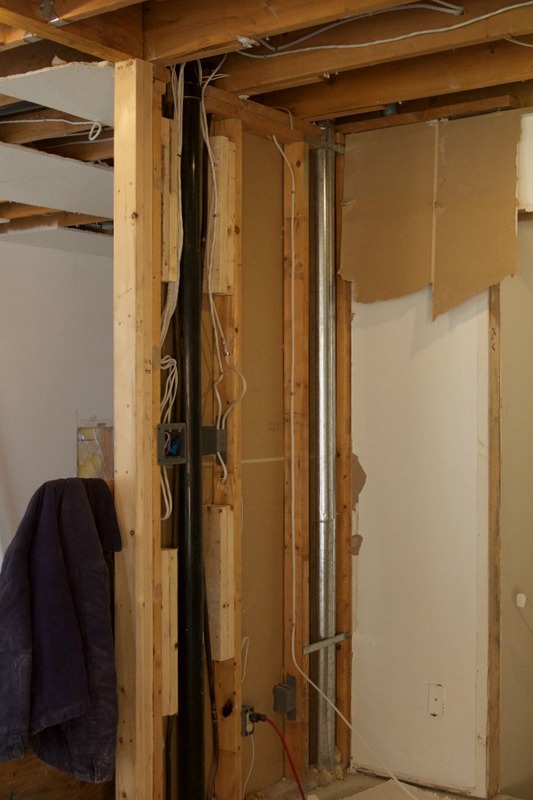 This was one of the walls that I wanted gone during renovation but a partial one had to stay because of the sewer line. Here are a few renovation photos. 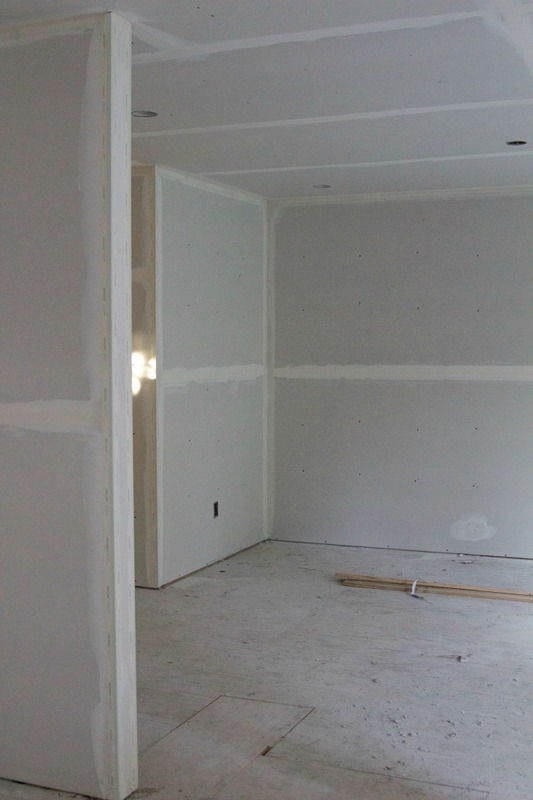 Nothing like fresh drywall…aaahhhh. You can see in this shot that the room really isn’t that big. 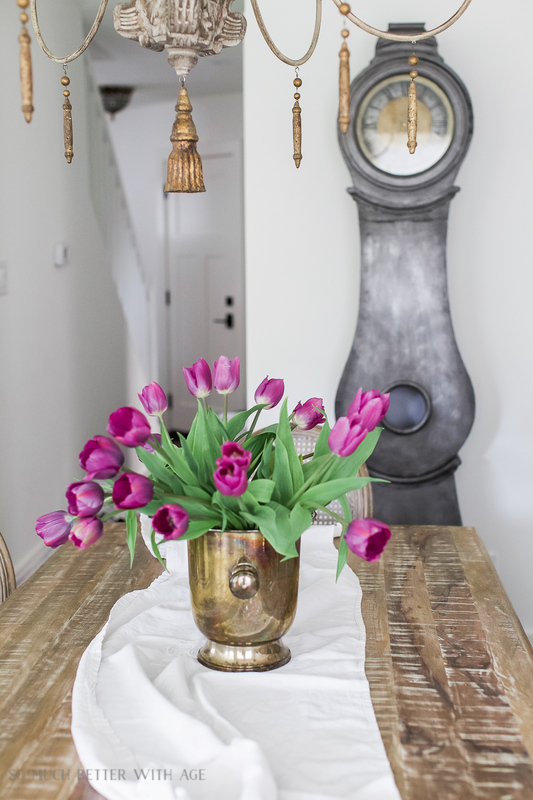 I did a lot of measuring to make sure I found the perfect size dining table and I also made sure that it stayed closer to that far wall so as not to impede on all the traffic zones. The chandelier was hung more to the far wall side too. As you can see I replaced the sliding glass doors with new French doors leading out to the backyard. 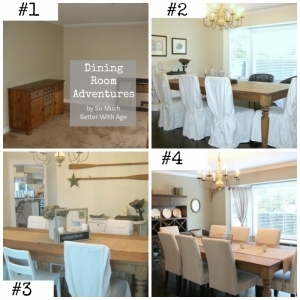 To me, nothing is more relaxing then having the doors swung open in the dining room to dine sort-of al fresco. And now here are the after photos. 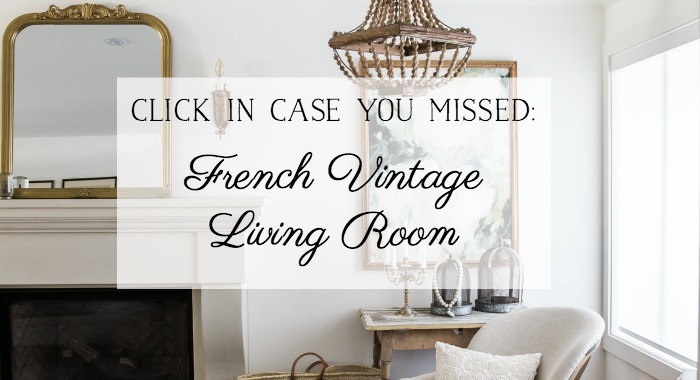 There are just the basics in this room but the items I’ve chosen are things I absolutely love and keep in line with my French Vintage style. The cabinet/bookshelf came with the house and there is just enough room to keep it tucked on that wall. I wanted this room to be more sparse but once I put the cabinet in there to hold all my decor stuff, I kept it there and love how it looks. 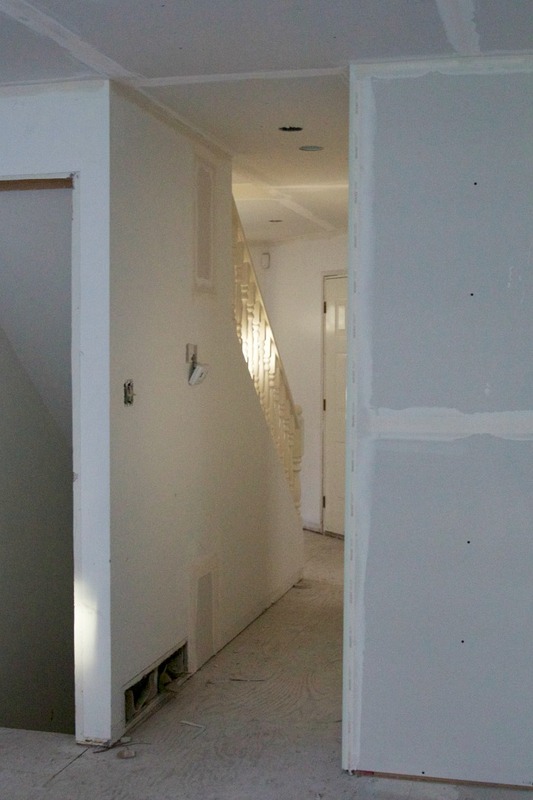 Here is a view down the hall with new doors, bannisters and light fixtures. 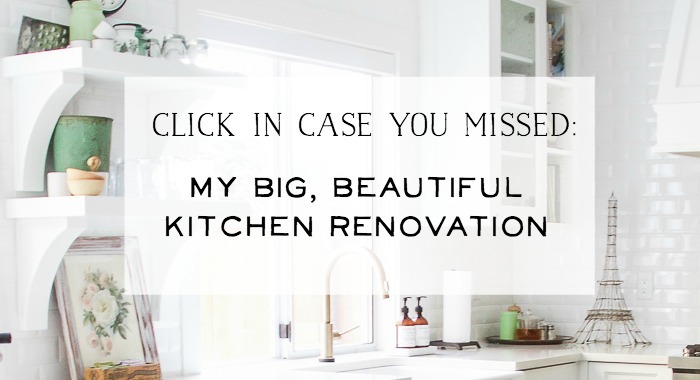 You can read about my big kitchen renovation here. 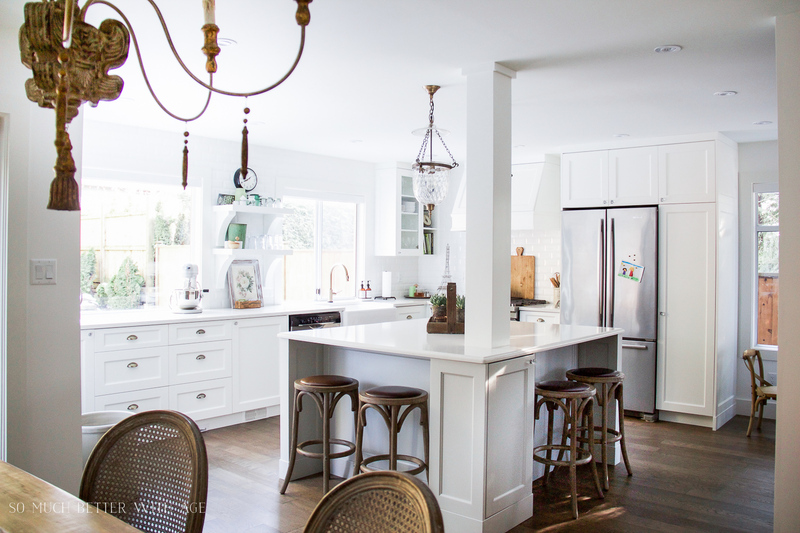 Even though two load-bearing walls were removed and a beam installed in their place, that post on the kitchen island still needed to stay because the floor joists changed direction at the kitchen (don’t ask me why!). 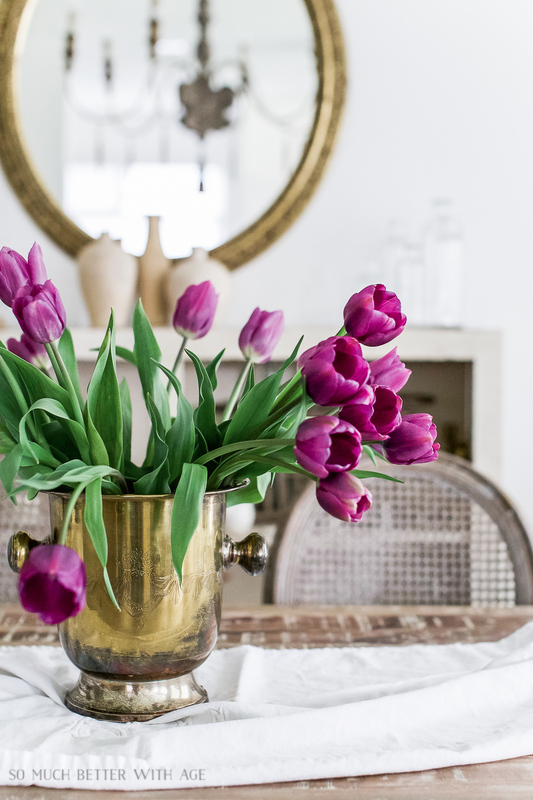 Everything in this room is neutral like the rest of my house so when flowers are brought in like these fresh tulips, they just can’t help but need photographing. What do you think? Isn’t that a big difference? 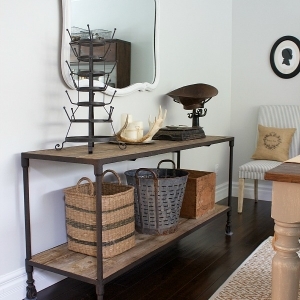 Don’t be afraid to change rooms that aren’t meant to be what they were made for. Change things up to what works best for your family and your lifestyle. I love what you did it looks like it would work better. 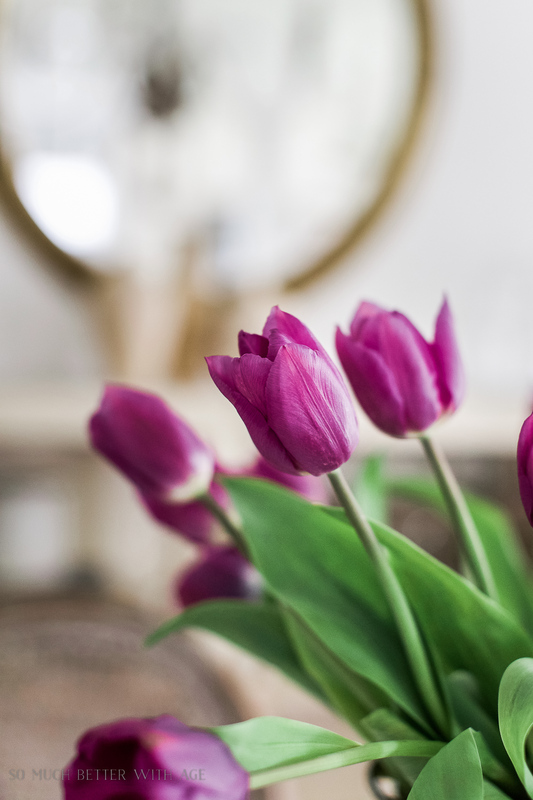 love your dr.
You have so beautifully transformed your home into a place of sheer elegance and delight for you and your family to enjoy! Awww, thanks Shirley! I love it so much now that it’s out of the 80s lol. 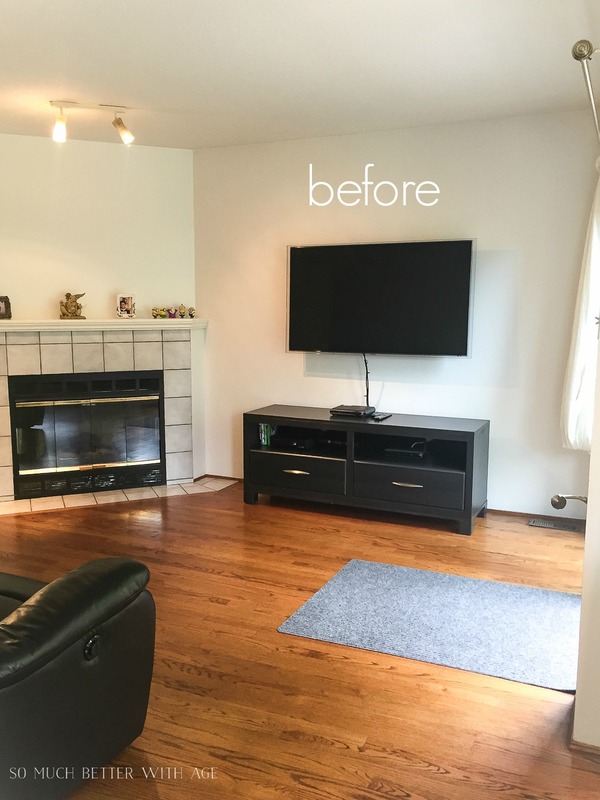 What a huge difference a straight wall makes. 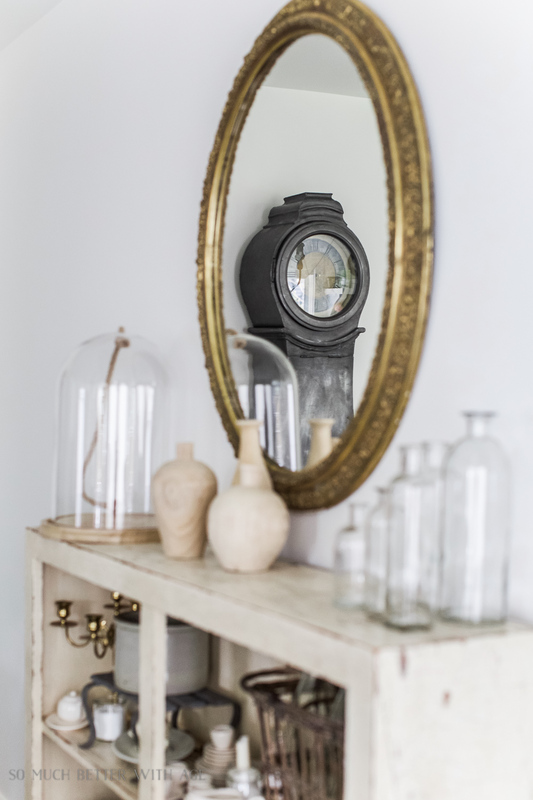 Love your home. I know! Such a difference. Thanks Pamela! It is so smooth now, it flows so well. That post in the kitchen seems to anchor the room a bit, think it actually helps. 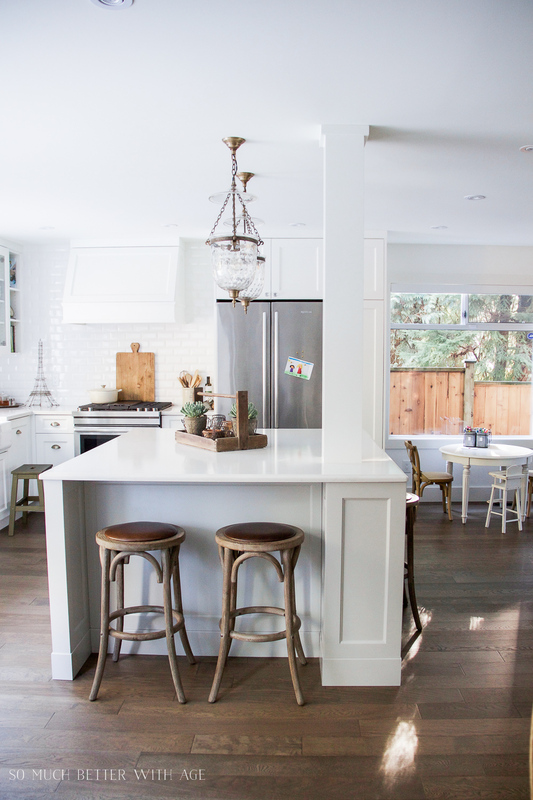 Did you reuse the old floor or put down new stuff? So now you have a living room and a dinning room, yes? I’ve never understood why people needed two family/living rooms on the same floor, basically one on top of the other. One usually is wasted space. Your home is lovely. I’ve never understand that either, Jauquetta. That’s why the living rooms stayed so formal. I’d rather use every room in my house! New flooring had to be put down as two walls were removed. It also made it more cohesive as there was tile in the front hall and entryway. Thanks for your sweet comment. hey girl – Love the change! So pretty! 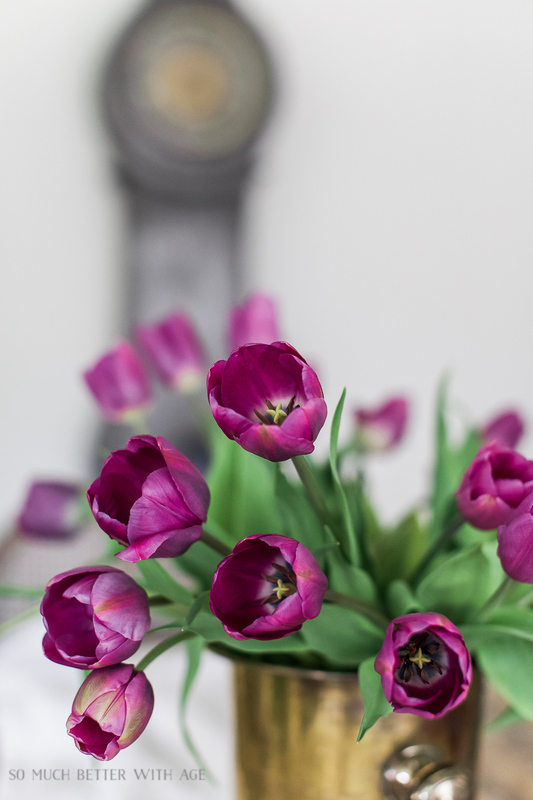 I just love those tulips to ! I know, I can’t believe it’s been a year already either! I’m organizing and decorating lol. 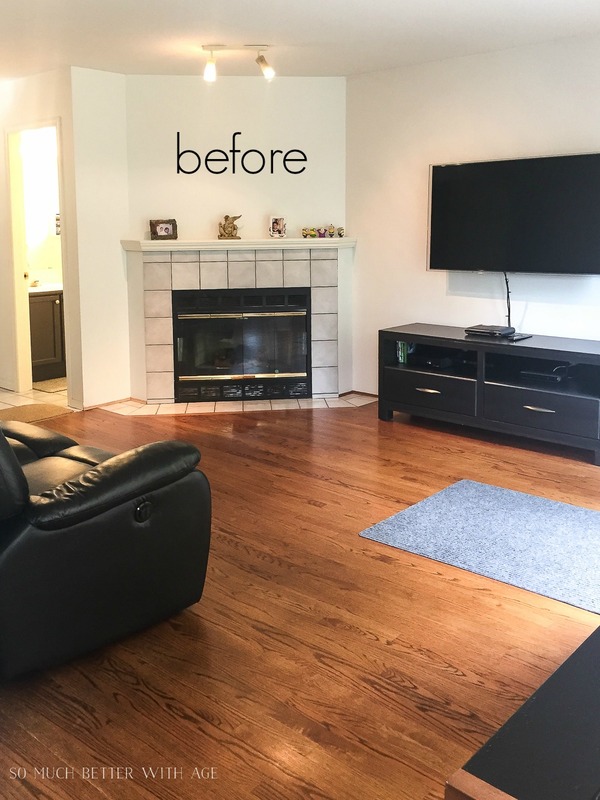 WOW – What a transformation. 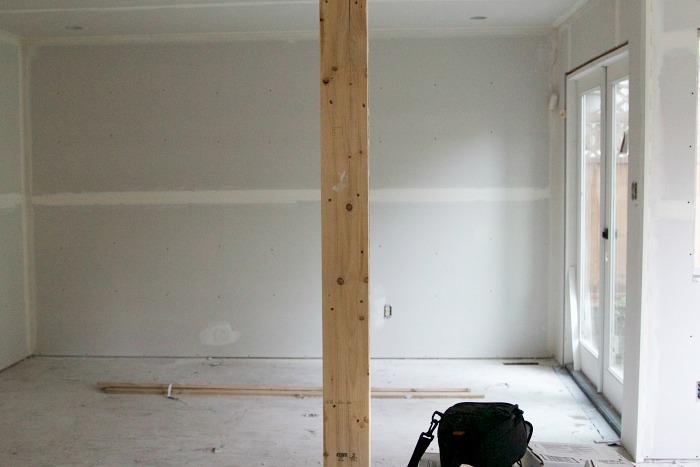 Love everything, especially the removal of the slanted wall. That made such a difference and I am sure much easier to work with. 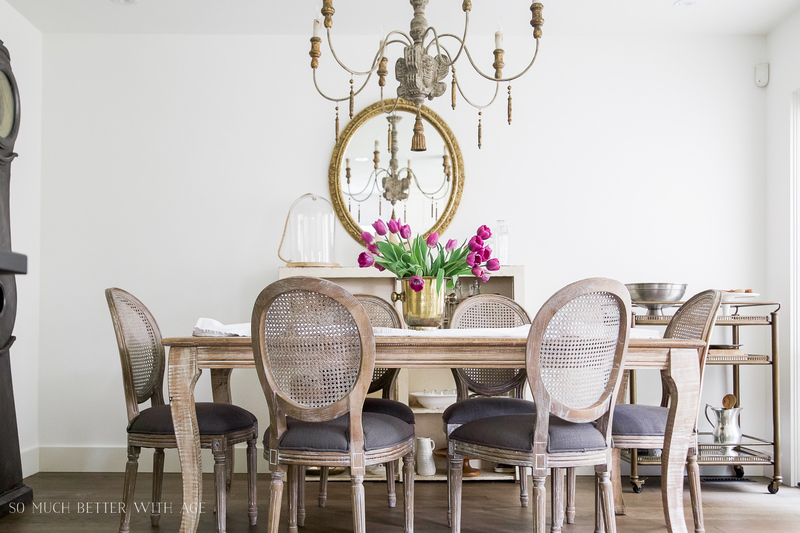 My favorite thing is the chandelier – I do love, love it ! 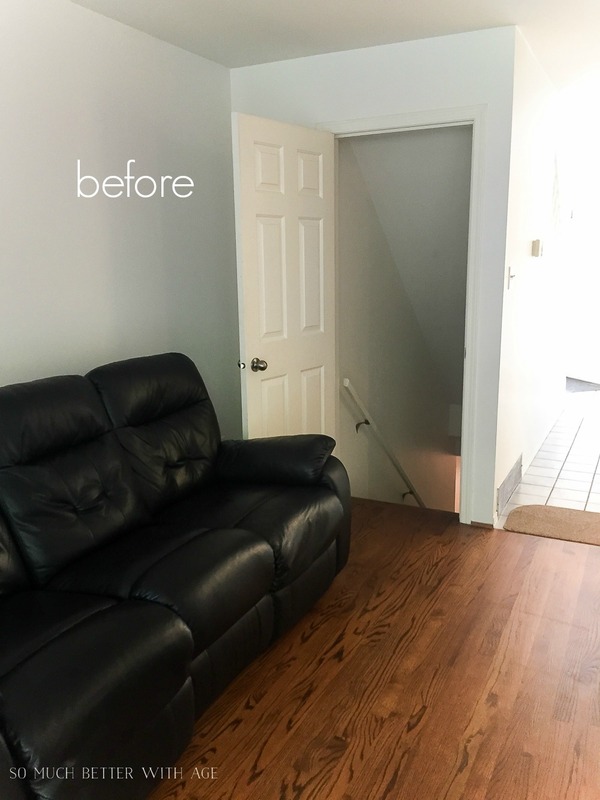 Great job – enjoy your new space! Thanks so much, Sandra! I know, what a difference taking out that wall! And I love the chandelier too. My favourite thing in my whole house I think (besides my fireplace). Looks lovely and approachable. Great vision! I also love your chandelier! Can you tell me where you got it? It is stunning! Love the transformation! I’ve added a source list towards the end of the post. I love that chandelier too, it’s my favourite! Perfect! Thank you so much Jamie! Hi Jamie! Love your style! Its exactly the look I’m going for as well. 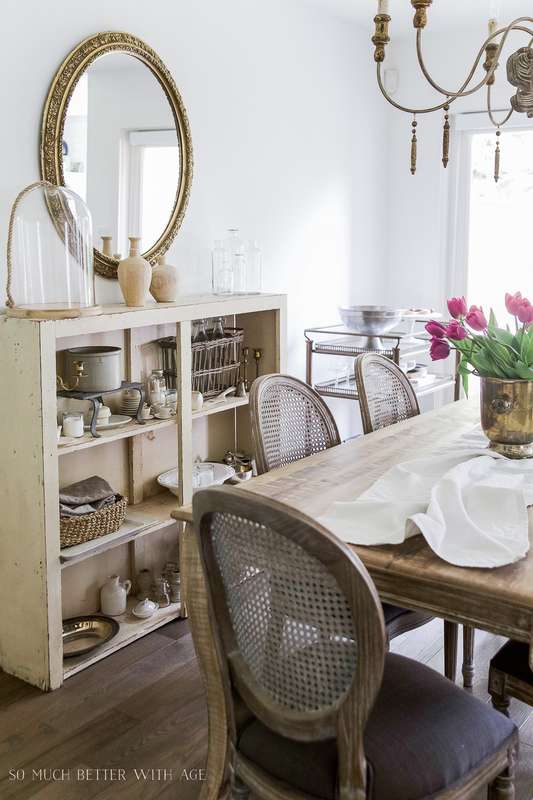 Can you please tell me where you got your dining table? Thank you! Hi Sophie, thank you so much! 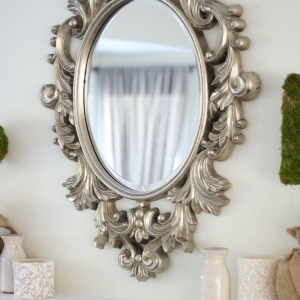 I bought it at a local shop and I’ve seen it before at Wayfair but currently they don’t sell it. I’ve been meaning to search for a new source for it and will soon!